The pictures shown above were taken on the border of Spain and Portugal near to Azinhal; the picture below was taken in southern France. Although occasionally reported from Britain, this species is not (yet) authenticated as a British species in the British Mycological Society's Checklist of Fungi of the British Isles. Omphalotus olearius is an uncommon but far from rare find in southern Europe, including southern France, Spain, Portugal and other Mediterranean countries. This saprobic mushroom was described in 1815 by Augustin Pyramis De Candolle, who gave it the binomial scientific name Agaricus olearius. (Most gilled fungi were initially placed in a giant Agaricus genus, now mostly redistributed across many other newer genera.) 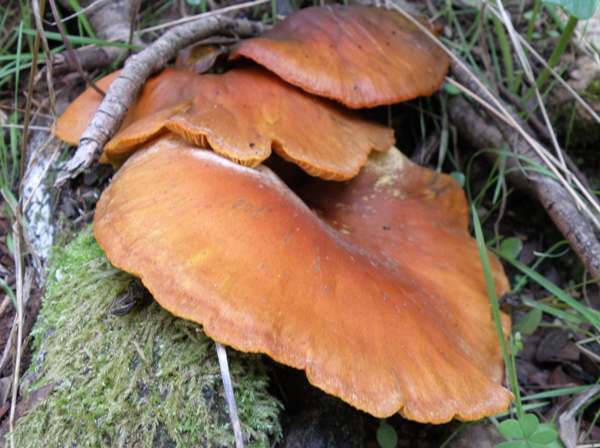 The currently accepted scientific name Omphalotus olearius dates from a 1946 publication by the German-born mycologist Rolf Singer. Synonyms of Omphalotus olearius include Agaricus olearius DC. 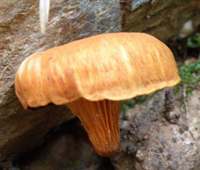 The genus name Omphalotus means umbilicate (in the form of a navel), and refers to the central depression in mature caps, as seen in the picture above. You may be pleased to know that the specific epithet olearius is not a reference to Ryanair's chief executive Michael O'Leary or to any other member of the O'Leary clan; olearius means 'of the olive tree' - and indeed it is with olive trees that this saprobic mushroom is nearly always associated, at least in southern Europe. 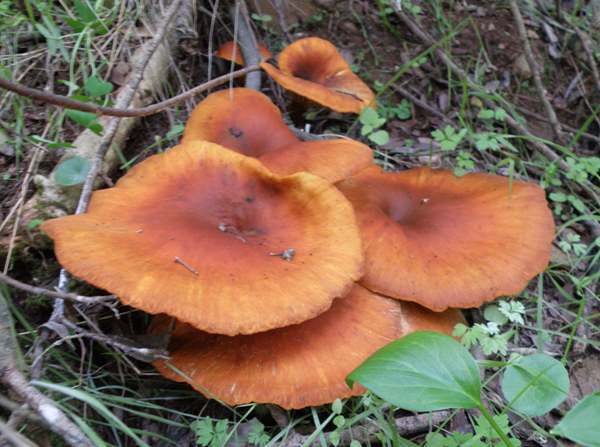 Confusingly, some people refer to this mushroom as Jack o' Lantern - a common name it therefore must share with Omphalotus illudens with which it was considered conspecific until recent studies convinced most authorities that although macroscopically inseparable the two are indeed quite distinct species. 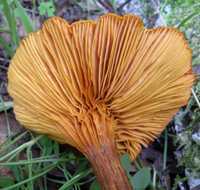 7 to 20cm across; initially convex with an inrolled margin, flattening and eventually developing an upturned wavy margin; smooth; bright orange to yellowish orange. Decurrent; non-forking; colour as cap. 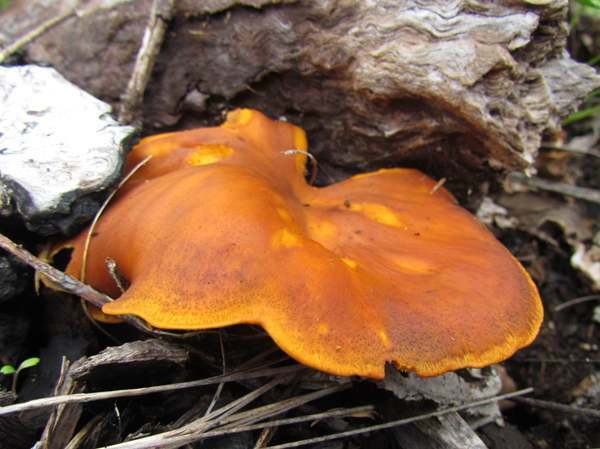 4 to 14cm long and 1 to 2.5cm diameter, smooth, tapering towards the base; orange, darkening towards the base. 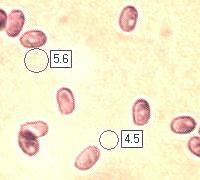 Ellipsoidal to globose, smooth, 5-7 x 4.5-6.5µm. Odour quite strong but pleasant; taste not distinctive. Saprobic, mainly under olive trees in southern Europe. September through to January in southern Europe. 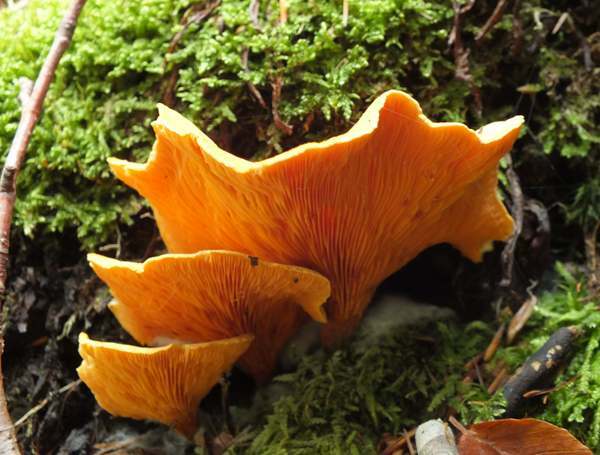 Hygrophoropsis aurantiaca has forked gills and does not form caespitose clusters.